Scheele's house with his pharmacy in Köping. Carl Wilhelm Scheele (December 9, 1742 - May 21, 1786), was a German-Swedish pharmaceutical chemist. He was a prolific scientist whose humble circumstances and equipment did not prevent him from making scores of important chemical discoveries. He was the first to discover oxygen and to produce chlorine gas. Yet, much of what he did had to be rediscovered because it was not appreciated by his fellow scientists. Although his name is not as well recognized as many of his contemporaries, his work had a major impact on the development of chemistry. Scheele was born in Swedenborn in Stralsund, Western Pomerania, Germany, which was at the time under Swedish rule. He was one of eleven children of a merchant, Joachim Christian Scheele. At age 14, he adopted the vocation of a pharmacist in the establishment of Martin Anders Bauch of Gothenburg. His brother had also worked for Bauer but died three years before Scheele began his apprenticeship. Scheele served for the first six years as a pupil, and three additional years as an assistant. During this period, he availed himself of Bauer's fine library, and by study and practice acquired an advanced knowledge of the chemistry of his day. It is said that he studied at the pharmacy after hours, and while conducting experiments late one evening, he triggered an explosion that shook the house and disturbed its occupants. Scheele was told to look for work elsewhere. He then was hired as an apothecary's clerk in Kalstom's establishment in Malmö, where he remained for two years. He then served in the establishment of Scharenberg in Stockholm. At this time, he submitted a memoir on the discovery of tartaric acid, but it was rejected by the Swedish Academy of Sciences as he was not well known at the time. This is said to have discouraged Scheele and made him reticent to contact those who would have most appreciated his work. He would not become a member of the academy until he was 33. Scheele's career as a scientist dates to his work in Stockholm. After spending six years there, Scheele transferred to the shop of Look in Uppsala, in 1773. It was during this time that he is said to have met the famous Swedish chemist Torbern Olof Bergman, professor of chemistry at the University of Uppsala. As the story goes, Scheele's employer, who supplied Bergman with his chemicals, brought Bergman to the pharmacy to consult Scheele on a matter that had been mystifying him. Scheele offered a clear explanation, and in other ways demonstrated a depth of understanding of chemical phenomena of all kinds. Besides befriending Scheele, Bergman was instrumental in bringing Scheele's accomplishments to the attention of the scientific community, and in having his work published. 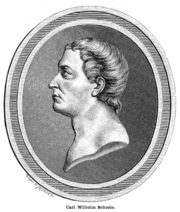 Scheele thus began to earn an international reputation, and corresponded with the likes of Henry Cavendish, of Great Britain, and Antoine Lavoisier, of France. In 1775, Scheele hoped to purchase a pharmacy so that he could work independently. His first attempts to acquire a business were unsuccessful, but they led to many invitations to do research and teach in a variety of European capitals. Scheele turned these offers down, preferring to remain in a profession he knew well and that provided sufficiently for his expenses. After a year's delay, he was successful in purchasing a shop in Koping from Sara Margaretha Sonneman, who had inherited it from her late husband, Hinrich Pascher Pohls. Scheele found that the establishment was saddled with debt, which he succeeded in paying off by diligent attention to his business affairs over a number of years. During this time, he and Pohls's widow kept house together for the sake of economy. He eventually married her, only a few days before his death. Scheele managed to retire the entire debt of his new business, and was able to build himself a new home and laboratory. One of his sisters came to assist Scheele in managing the pharmacy and household. Thus they were able to live fairly comfortably for Scheele's remaining years. During the last decade of his life, Scheele was often visited by scientists who tried to probe his fertile mind. Scheele preferred to entertain in his laboratory or at his pharmacy, and traveled little. He suffered from gout and rheumatism, but continued his scientific work up to the final month of his life. His illness was probably brought on by his constant exposure to the poisonous compounds he worked with. He died on May 21, 1786. Unlike scientists such as Antoine Lavoisier and Isaac Newton, who were more widely recognized, Scheele had a humble position in a small town, and yet he was still able to make many scientific discoveries. He preferred his small dwelling to the grandeur of an extravagant house. Scheele made many discoveries in chemistry before others who are generally given the credit. One of Scheele's most famous discoveries was oxygen produced as a by-product in a number of experiments in which he heated chemicals, during 1771-1772. Scheele, though, was not the one to name or define oxygen; that job would later be bestowed upon Antoine Lavoisier. Before Scheele made his discovery of oxygen, he studied air. Air was thought to be an element that made up the environment in which chemical reactions took place but did not interfere with the reactions. Scheele's investigation of air enabled him to conclude that air was a mixture of "fire air" and "foul air;" in other words, a mixture of oxygen and nitrogen, the one breathable, the other not. He performed numerous experiments in which he burned substances such as saltpeter (potassium nitrate), manganese dioxide, heavy metal nitrates, silver carbonate and mercuric oxide. However, his findings were not published until 1777 in the treatise, Chemical Treatise on Air and Fire By then, both Joseph Priestley and Antoine Lavoisier had already published their experimental data and conclusions concerning oxygen. In his treatise, Scheele also distinguished heat transfer by thermal radiation from that by convection or conduction. Scheele's study of "fire air" (oxygen) was sparked by a complaint by Torbern Olof Bergman. Bergman informed Scheele that the saltpeter he purchased from Scheele's employer produced red vapors when it came into contact with acid. Scheele's quick explanation for the vapors led Bergman to suggest that Scheele analyze the properties of manganese dioxide. It was through his studies with manganese dioxide that Scheele developed his concept of "fire air." He ultimately obtained oxygen by heating mercuric oxide, silver carbonate, magnesium nitrate, and saltpeter. Scheele wrote about his findings to Lavoisier who was able to grasp the significance of the results. In addition to his joint recognition for the discovery of oxygen, Scheele is argued to have been the first to discover other chemical elements such as barium (1774), manganese (1774), molybdenum (1778), and tungsten (1781), as well as several chemical compounds, including citric acid, glycerol, hydrogen cyanide (also known, in aqueous solution, as prussic acid), hydrogen fluoride, and hydrogen sulfide. In addition, he discovered a process similar to pasteurization, along with a means of mass-producing phosphorus (1769), leading Sweden to become one of the world's leading producers of matches. In 1775, Scheele discovered the mineral pigment copper arsenide, known afterwards as Scheele's Green. The compound was generally replaced by pigments of lower toxicity. Scheele made one other very important scientific discovery in 1774, arguably more revolutionary than his isolation of oxygen. He identified lime, silica, and iron, in a specimen of pyrolusite given to him by his friend, Johann Gottlieb Gahn, but could not identify an additional component. When he treated the pyrolusite with hydrochloric acid over a warm sand bath, a yellow-green gas with a strong odor was produced. He found that the gas sank to the bottom of an open bottle and was denser than ordinary air. He also noted that the gas was not soluble in water. It turned corks a yellow color and removed all color from wet, blue litmus paper and some flowers. He called this gas with bleaching abilities, "dephlogisticated acid of salt." Eventually, Sir Humphry Davy named the gas chlorine. By the time he was a teenager, Scheele had learned the dominant theory on gases in the 1770s, the phlogiston theory. Phlogiston was classified as "matter of fire." The theory stated that any material that was able to burn would release phlogiston during combustion and would stop burning when all the phlogiston had been released. When Scheele discovered oxygen, he called it "fire air" because it supported combustion. He explained oxygen in terms of the phlogiston theory, which he accepted. Historians of science generally accept that Scheele was the first to discover oxygen, among a number of prominent scientists—namely, his contemporaries Antoine Lavoisier, Joseph Black, and Joseph Priestley. It was determined that Scheele made the discovery three years prior to Joseph Priestley and at least several before Lavoisier. Priestley relied heavily on Scheele's work, perhaps so much so that he may not have made the discovery of oxygen on his own. Correspondence between Lavoisier and Scheele indicate that Scheele achieved interesting results without the advanced laboratory equipment that Lavoisier employed. Through the studies of Lavoisier, Joseph Priestley, Scheele, and others, chemistry was made a standardized field with consistent procedures. In many ways, Scheele was far ahead of his time. Much of what he did had to be rediscovered because it was not appreciated by his immediate contemporaries. His insight into radiant heat and his discovery of chlorine gas are just two instances where his work was entirely glossed over and had to be rediscovered by others. He discovered oxygen before Priestley and Lavoisier, and this discovery became an essential stepping-stone toward invalidation of the long-held phlogiston theory. He made important forays into organic chemistry, a field that would not open up until 40 years after his death. Scheele was one of the pioneers of analytical chemistry. All of this was accomplished with a minimum amount of equipment, most of which he designed himself. Although credit for many of his discoveries goes to others, and his name does not command the same level of recognition as many of his contemporaries, his accomplishments were of great importance to chemistry, and had a major impact on its development. Ihde, Aaron John. 1984. The development of modern chemistry. New York: Dover Publications. 50-53. ISBN 0486642356. Anonymous. 1839. The life and works of Sir Humphrey Davy. The Citizen: a monthly magazine of politics, literature and art. Dublin: J.P. Doyle. 1:98-103. Tilden, William A. 1921. Famous Chemists, the Men and Their Work. London: G. Routledge & Sons. Abbot, David. 1983. Biographical Dictionary of Scientists: Chemists. New York: Peter Bedrick Books. Scheele, Carl Wilhelm and Leonard Dobbin. 1931. The Collected Papers of Carl Wilhelm Scheele. London: G. Bell & Sons ltd.
Farber, Eduard, ed. 1961. Great Chemists. New York: Interscience Publishers. Schofield, Robert E. 2004. The Enlightened Joseph Priestley: A Study of His Life and Work from 1773-1804. Pennsylvania: The Pennsylvania State University Press. Sootin, Harry 1960. 12 Pioneers of Science. New York: Vanguard Press. History of "Carl Wilhelm Scheele"
This page was last modified on 2 April 2008, at 16:00.